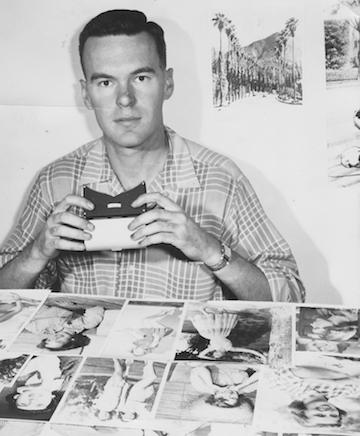 Don't miss this photography exhibit featuring the images of Altadena eccentric Leon Ricks. 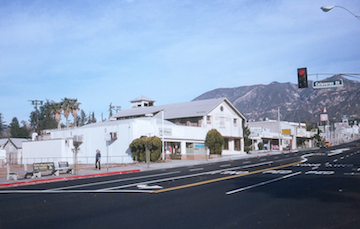 Leon documented Altadena between the 1960s and early 2000s. Twenty of his early photos are on display Feb 20 - July 20 in the gallery corridor at Webster's Community Pharmacy (2450 N. Lake Avenue) flanked by the same views today. Read Larry Wilson's Pasadena-Star News column about Ricks and the exhibit. For the Webster’s exhibit, Altadena photographer and director Rod Holcomb cleaned the negatives and then returned to the sites of Ricks’ photos to record the same views today--taking special care to place telephone poles and other landmarks in exactly the same position. Ricks was socially awkward and had mannerisms that were eventually thought to be symptomatic of Asperger’s Syndrome. He photographed the same intersections numerous, identical times. He saved every page of the Los Angeles Times and the Pasadena Star-News, filling every room of his house to a depth of several feet. And he spent decades engrossed in reincarnation and parapsychology, especially his theory--which he called “The Pattern" - having to do with Altadena and the reincarnation of Spanish explorer Ponce de Leon. Ricks was a good photographer and his views of Altadena will bring back a flood of memories for anyone who grew up here. 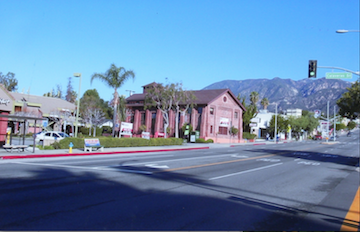 On Saturday March 14 from 12 to 4 p.m. Webster's Community Pharmacy will host a public reception celebrating the "Altadena Then and Now" photo exhibit mounted by the Historical Society in the store's east hallway gallery. Enjoy refreshments by Park Bench Grill. The store is at 2450 N. Lake Ave. "Everyone is invited to stop by, enjoy this fantastic exhibit of 40 photos and exchange their Altadena stories and memories," said Meredith Miller, Webster's Community Pharamacy co-owner.